i went to boston over my spring break and instead of telling you every moment of every day, i figured it would be better served with a blog de la photo. 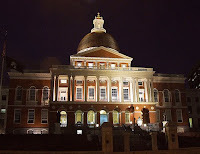 there is so much history in boston, that my attempt to address it all here would be endless anyway. 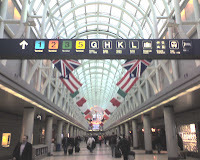 everyone knows this place. cheers. we didnt eat at this particular one. we ate at the imitation one. this is the “original” that literally has about 10 tables. we ate at the one in faneuil hall. it was pretty good. it was no kincaid’s mind you. but good. not everyone can appreciate this one. this is berklee college of music. i’ve wanted to attend forever. it’s expensive, but one of the best music educations in the country. when we walked in i felt like i was in a ghetto high school. some EXTREMELY talented people go/have gone here. melissa ethridge, natalie maines, quincy jones, john mayer for example. this is faneuil hall market place. it’s a really cool place. built in 1742 as the central market place to all of boston, samuel adams rallied citizens of boston to seek independence from great britan, it’s also housed speakers from oliver wendall holmes to susan b. anthony. still a marketplace, housing several shops and restaurants today in and around the hall. at left is the “T”, or Massachusetts Bay Transit Authority. 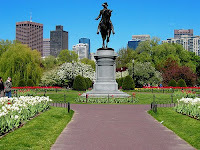 boston boasts the birthplace of american mass transportation, first appearing in boston in 1631 with horse and carriage. the first stagecoach operated between boston and cambridge in 1793 and the first “electric street car” in 1889.
this is the charles playhouse which houses blue man group, one of the most interesting shows i’ve ever seen. charles playhouse was originally built in 1839 as a church. at left is the omni parker house. no we didnt stay here. 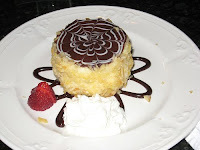 this is america’s longest continually operating luxury hotel, opened in 1855. this hotel is the birthplace of the boston cream pie (see below) and the parker house roll. malcom x was a busboy here in the 1940’s, emeril lagasse also spent time here. john f. kennedy proposed to jackie bouvier here as well. this hotel was also the home to the Saturday Club, also referred to as the Saturday Night Club, which consisted of literary dignitaries such as Henry David Thoreau, Charles Dickens and Ralph Waldo Emerson. this is the famed boston cream pie. it was good. but it was $7. but it was worth it. of course, no trip to boston would be complete without visiting fenway. the tour guide’s terminology was intriguing. he kept mentioning “if you ever GET to come to a game” and that was so true because the ticket office had the whole game schedule in their office, 90% of games were sold out already. the remaining 10% were standing room only or single seats only. thats incredible to me. You are welcome. We DID have a good trip. It WAS needed. where everybody knows your name. and they’re always glad you came. our troubles are all the same. you wanna’ go where everybody knows your name.